Hanoi (VNA) – The fulfilment of the gross domestic product (GDP) growth of 6.7 percent in 2017 requires high political determination from ministries and departments as well as corporations, businesses and people, Prime Minister Nguyen Xuan Phuc stressed at a meeting in Hanoi on August 12. Addressing the conference between the Government’s Standing Board and ministries, sectors, economic groups and corporations, the PM noted that in order to realise the aforesaid target, the growth in the six remaining months of this year must be at a high level of 7.42 percent. He stressed that this is an important political task of all sectors, especially agriculture, industry, construction, processing and manufacturing. According to the Ministry of Planning and Investment, the surging GDP in the second quarter raised the January-June growth rate to 5.73 percent. The service sector made the biggest contribution to the overall growth (2.59 percentage points), particularly in wholesale, retail, accommodation, catering, finance, banking, insurance, and real estate. The total volume of international tourists to Vietnam in the period was 7.42 million, a year-on-year rise of 28.8 percent. While the mining industry suffered from a sharp decline, the agriculture, forestry and fishery sectors have recovered with a growth rate of 2.65 percent. The average consumer price index (CPI) rose by 3.91 percent in the first seven months, below the National Assembly’s set target of 4 percent. To reach the goal of 6.7 percent, the GDP growth must be at the minimum level of 7.23 percent in the third quarter and 7.57 percent in the fourth quarter, the ministry estimated. 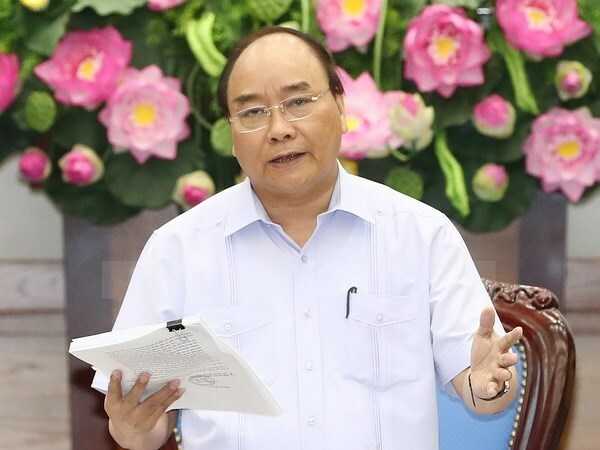 PM Phuc recognised this as a heavy task given unpredictable regional and global developments, plus the peak of the flood and storm season in the country. He gave approval of measures proposed at the meeting to extricate difficulties for businesses and improve the investment climate. The PM asked all sectors to act more firmly to reduce business expenses and support production in term of tax and fees, as well as promote trade and innovation, and remove institutions that hinder the country’s development. He stressed ensuring macro-economic stability is still the top priority of the Government and asked the Ministry of Planning and Investment to coordinate with relevant ministries and economic sectors to improve fiscal, trade and investment management tools, curb inflation, promote growth, and keep a close watch on the domestic and international affairs in order to make timely response to any arising problems. Phuc also requested increasing individual responsibilities in management. The Government will hold meetings to address outstanding difficulties for businesses and promote role of key economic regions, he said. He suggested stimulating domestic consumption, creating confidence in the market, and increasing investment in business production, while striving to reach a credit growth of 21 percent and stepping up the reshuffle of State-owned enterprises, especially the equitisation and divestment process in the remaining months of 2017. The PM ordered quick allocation and disbursement of funding for climate change programmes and improvement of State budget collection and thrift practices in all sectors and enterprises.